1. To submit for decision and approval of the installation of a small memorial or similar; recording over the century’s the existence of Workington’s coal mining operation’s legacy and heritage, and of the people who worked and tragically died within it. That a suitably inscribed information memorial be installed in an appropriate location to commemorate the industrial heritage of Allerdale and surrounding areas and the sacrifices of the men, women and children who worked in the Cumberland coal field, in the 18th, 19th and 20th centuries, funded by a contribution; possibly by a Coal Regeneration Scheme grant, and input from the Council. Firstly I have to declare an interest in this matter, I was born in Workington and on leaving school, in 1964, I started work at the then Solway colliery as a trainee coal miner. I also worked at Haig colliery and served at Winscales Mine Rescue Station until its closure in 1986. My father and brothers also worked within the local collieries and steelworks. "This is a reminder of where we have come from. West Cumbria was built on steel and on coal". 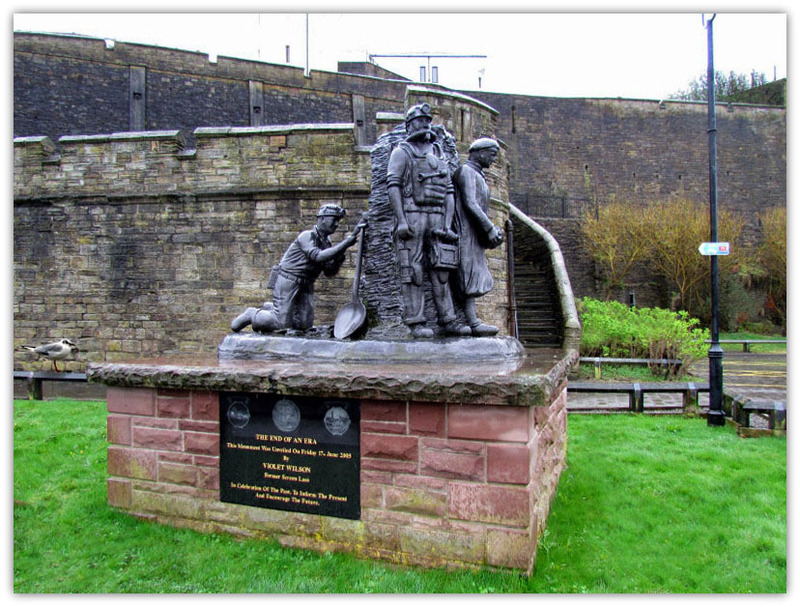 This got me thinking; Whitehaven’s rich coal legacy is, rightly, well documented with: Haig colliery’s mining museum and various memorials and tributes to the mining disasters that befell it’s workers. Workington’s coal mining legacy is not so readily available or apparent and I think it’s time that this was addressed. Within roughly two square mile from the possible location of the steelworks, the memorial to be positioned on Solway road. This is the location of the seven pits sites, these are: Charles, Anne, Jane, Buddle, Lady, Isabella and a more modern recent addition, Solway pit. There are many more spread within the whole boundary of Allerdale and the surrounding areas. It’s a reasonable assumption that mining began in Cumberland back in Roman times there are known to be well over 1,000 shafts, mines and bell pits in Cumbria. It was the development of the coal trade (from) 1650 onwards and the coming of the Industrial Revolution that changed Workington. High quality hematite iron-ore, acting as a magnet for steel and iron makers, drew industry to the area and provided the impetus for the town’s rapid growth as a place of industry. Unlike neighbouring Whitehaven and Mary port, Workington was not originally a coastal settlement. 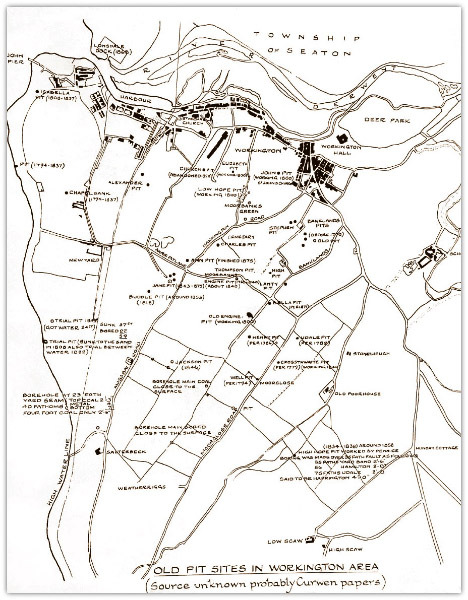 The old town developed on high ground near Workington Hall and expanded to the south and west as a result of industrial exploitation of the local coal and iron ore deposits. By 1800 there were no less than 37 pits around Workington. In 1837 disaster struck when the roof of Chapel Bank Pit collapsed and 27 miners and 28 horses drowned as sea water inundated the mine. The Curwen’s suffered heavy financial losses as a result of this incident and made renewed attempts to find fresh sources of coal by sinking Jane pit in 1843 followed by Annie Pit in 1864. The expansion of the mines aided exports, prompting the Curwen’s to build Lonsdale Dock in 1865 to take ships up to 2000 tons. A major shipbuilding industry developed in the wake of the new dock, providing collier brigs for coal exports. In 1927, the dock was enlarged again, this time to take 10,000-ton ships, and re-named the Prince of Wales dock. The coal mines were nationalised in 1st January 1947 and most were owned by the people under the banner of the ‘NCB, National Coal Board and mechanisation was brought in; by the end of the 60’s coal mining was in rapid decline. The proposed memorial will enhance the local historical knowledge and provide interpretive historical information for the community in line with the community and cultural plan. If successful, then, the final wording and location of the memorial should be developed in consultation with interested parties. Mr. Anthony Dagleish, of Workington, a veteran miner, has given a "News" representative some interesting reminiscences regarding West Cumberland pits. Mr. Dagleish has worked in the pits for 59 years, starting at the age of nine and giving up work in 1918 at the age of 68, after an accident from which he narrowly escaped with his life, and which left him unfit for further work. "I would be working yet," he said, "if it hadn't been for that mishap. I was working in a two feet eight inch seam in William Pit, Whitehaven, and I raised my head where I thought the roof had been made a little higher. It wasn't any higher though, and I got a knock which almost broke my neck. If I want to look towards the right now I have to move my whole body round, because the doctors have told me that if I twist my head I'll most likely break my neck." This states the prevailing conditions the miners had to overcome on earning their daily bread. Even more remarkable is Mr Dagleish’s age, these experiences would be the norm amongst his peers. Coalminers had few employment rights and therefore coalmine owners had little need to keep records of those in their employ in the 18th and 19th century’s, so this interview gives a rare insight into the prevailing working conditions of the day. This piece dated 8th September 1927 and taken from the Whitehaven News. "I have been a miner all my life, except during a strike when I spent a whole summer making bricks. For a few months when I was a boy I worked with a butcher, a jeweller, and a doctor, but those occupations were not active enough for my taste, so I went back to the pits. I have worked in Buckham Pit, Water Gate Pit, Robin Hood, again at Buckham, Old St Helen's, Annie Pit, Jane Pit, and Charlie Pit, Siddick, Clifton, Camerton, Codfitz, and several small workings at Winscales, and William Pit, Whitehaven. I was in five explosions at Annie Pit, and two at Buckham. I was fortunately never hurt in any of them." "People say that the sea came into Annie Pit, but it didn't. Annie Pit's workings were far enough away from the sea. The plain fact is that the owners took the pumps out of it, and as water will collect in any pit, it soon became flooded. I can say without exaggeration that Anne Pit has one of the finest shafts I ever saw. There is plenty of good coal in it yet, only waiting to be taken out. People won't believe that. It was closed in 1875. I have been in a good many strikes, some of them long ones, but we never went back any better than we came out. I remember one strike lasting seventeen weeks. They wanted to take ten or fifteen per cent off us when we had only between 4s and 5s a day. "Flooding of Isabella Pit" There has always been a variety of stories current in the town on the end of Bella Pit and how it came to be flooded. My father worked in it, and was one of the last men to get out when the sea broke in, and my grandfather sank the shaft over a hundred years ago. There were either 28 men and 29 horses lost, or 29 men and 28 horses. It was 147 fathoms deep (882 ft), to the Main Band, and when it had been worked for some years a seam of very good coal was found, which, however, travelled upwards towards the sea. The local manager dare not work it, as both he and the men knew the sea would come in and drown the lot of them if they did." This manager was got rid of in some way or other, and a man brought from Newcastle. The first time the new manager was down the pit he spotted the coal, and despite all explanations and warnings, he insisted that it must be got out. In the end he got his way, and the men had to work the coal with the sea water trickling through it in front of their eyes. They didn't know the minute the whole lot would cave in. One day when my father was in another part of the pit with a mate called Jack McGrath, they heard the sound of an explosion. "There's a fire somewhere, John," said McGrath. My father was always cool in danger and looking McGrath in the face he said quietly, "That's not fire Jack, that's water." "He was right. The sea had broken in at last. They had no lamps in those days and the wind caused by the inrushing water constantly blew their candles out. When they reached the pit shaft the horses were being lashed into the cradles and hauled up. There was no time to lash some of them up properly, however, and they had to be left. My father and McGrath were about the last two to leave the pit. At the top they met the manager, who shouted "Get candles and some men, John, and go down the pit. There are some men down there yet." Old John looked at him, and then said, "Yes, there are some men down there. But it's no use going for them, for they're all drowned and the blame's on you for working that coal." The other shouted back, "I'll tell you what, Dagleish, the Curwen's will have no use for you after today." "No", came the answer, "and I'll see to it that by this time tomorrow they have no use for you." The manager said nothing, and went away, no one knew where. He was never again seen by a living soul, from that day to this. Whether he just fled for fear of what might happen to him as a result of the disaster, or whether during the night the men carried out their threat to throw him down the pit shaft to drown in the flood he had caused, was never known. A good many people believe he was thrown down the pit, for as far as could be ascertained, he was never seen anywhere after that day. This seam of coal in Bella Pit was far thicker and easier to work than anything else in the pit. It was 14 feet thick, and it was wanted badly. But the previous manager was afraid of it, and so were the men. He used to say "if you hag that you'll meet the devil," and he was right. He probably lost his job because he would not work it. It was impossible to discover whether the Newcastle manager really was thrown down the shaft or not, because the pit was quite flooded, and no bodies were got out of it. "Their bones lie somewhere in it to this day." (WCMR Research Note - The original manager was Matthias Dunn, who resigned over the issue, and went to work in the north-east. In the 1850's he became one of the first four mine inspectors, and in his later book he described the events. Miners had written to him, asking him to intervene on their behalf with the owner, but he was again ignored. The place where the water broke into the pit is at the distance of nearly a mile and a half from the shaft, between Salterbeck and Harrington, and about forty or fifty yards below water mark. The three pits, (Isabella Pit, Lady Pit — the one in which the accident occurred, and Union Pit, communicate with each other) were all filled with water by half past ten o'clock, being not more than an hour and a half from the time the roof gave way. Conditions of employment in the local coal mines would shock even the most hardened aid-worker fighting to outlaw child labour in foreign countries today. The evidence was so offensive, even to the Victorian public, that legislation was quickly introduced to outlaw the employment of women and girls underground and boys under the age of ten. Fortunately, nearly one hundred and sixty years later, such practices have long since vanished from the memory of local people. However, the accounts collected from children as young as seven, working at John Pit, Harrington and William Pit, Whitehaven, now provide a window back to these times and vividly portray the hardships these children endured at the hands of their masters. Ian Winstanley, a publisher of mining related works, has previously published the evidence gathered in the Lancashire Coalfields and has now turned his attention to the Cumberland reports. I trail with my brother, he’s 11. I’ve been more than two years. I like trailing. I trail 19 to 24 corves a-day. It does not tire me at all. My brother behaves well to me. I’d rather stop in the pit than go to school. I go down at 6 in the morning. I don’t know what time we come up, it’s never one time - never later than 6, nor before 2. I don’t go to Sunday-school. I go to chapel, but not regular. I don’t know who Jesus Christ was. I never heard about his dying. I never was taught my letters. We never fill. I stop about an hour at fore-end of the day and we have our bread and coffee. I shall have bacon and new potatoes to-day. The public became aware of conditions in the country’s collieries in 1838 after a freak accident at Huskar Colliery in Silkstone, near Barnsley. A stream overflowed into the ventilation drift after violent thunderstorms causing the death of 26 children; 11 girls aged from 8 to 16 and 15 boys between 9 and 12 years of age. The disaster came to the attention of Queen Victoria who ordered an inquiry. Lord Anthony Ashley-Cooper, 7th Earl of Shaftesbury headed the royal commission of inquiry which investigated the conditions of workers especially children in the coal mines in 1840. Commissioners visited collieries and mining communities gathering information sometimes against the mine owners’ wishes. The report, illustrated by engraved illustrations and the personal accounts of mineworkers was published in May 1842. Victorian society was shocked to discover that children, as young as five or six worked as trappers, opening and shutting ventilation doors down the mine before becoming hurriers, pushing coal tubs. Lord Ashley deliberately appealed to Victorian prudery, focussing on girls and women wearing trousers and working bare breasted in the presence of boys and men which “made girls unsuitable for marriage and unfit to be mothers”. Such an affront to Victorian morality ensured the bill was passed. A month after the report was issued; Lord Ashley delivered a speech to Parliament, demanding a bill which would regulate the employment of women and children in the mines. In his speech he asked the audience attention to be focused on the harsh working conditions of the miners that he qualified to ’perfectly intolerable’. To support his conviction, he made a parallel between’ the simplicity and the kindness’ of the workers and ’the folly and cruelty’ of the system. Moreover, to support his request, he raised the fact that the honest mines’ owners themselves begged for the right to improve the working conditions underground. The bill was presented to the House of Lords which modified some of its points. The age under which child labour was forbidden decreased from thirteen to ten years old, the employment of workhouses apprentices remained allowed from ten to eighteen years of age, and boys from fifteen years old were allowed to control the machines. Last but not least, the obligation to put children at work only one day on two was erased from the text. The House of Commons accepted the modified bill and the essential was at least saved. On 10th of August 1842, the bill became law with an astonishing rapidity. Further legislation in 1850 addressed the frequency of accidents in mines. 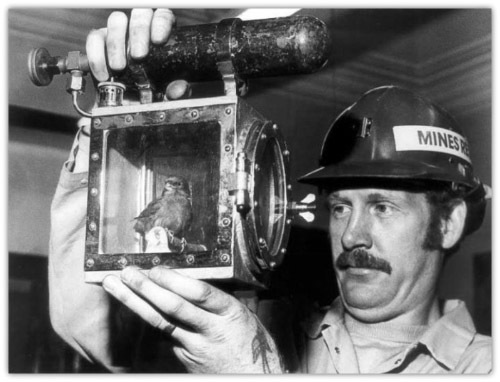 The Coal Mines Inspection Act introduced the appointment of inspectors of coal mines, setting out their powers and duties, and placed them under the supervision of the Home Office. The Coal Mines Regulation Act of 1860 improved safety rules and raised the age limit for boys from 10 to 12, further legislation would follow.